Jeffrey Welch's Blog: I Throw Away My Dog’s Poop In Your Trash Can. Why Does That Make You So Angry? If there is a trash can along my walking route, you can bet I’ve tossed a neatly tied bag of dog poop in it. Whether the can belongs to the city, a neighbor, or random store, it doesn’t matter. No trash can is off limits, and I don’t understand why it makes some people so angry. There are two types of people in the world: Those who think it is perfectly fine to toss bagged dog poop in someone else’s trash can, and those who shake their head in upset disbelief at such behavior. I am in the former camp. In fact, I dare say, I don’t even understand the latter. It’s a trash can, the sole purpose of which is to hold trash. I have some trash that just happens to be poop. One toss and the two — trash and trash can — can enjoy life together, at least until the next trash pickup day. My practice of throwing my dog’s number two in other people’s trash cans grew slowly. At first, I wouldn’t do it. “It’s not right,” I thought to myself, “because that isn’t my trash can.” Then I started to take baby steps, only throwing it in a trash can that was out on the curb and hadn’t been picked up yet, meaning my darling’s little pile of poop (or big — he is, after all, a large dog) spent just a few hours at the top of a full can until a truck came by to empty it. Finally, I took the leap and would happily chuck my used poop bag into any garbage can that dared be on my walking route. 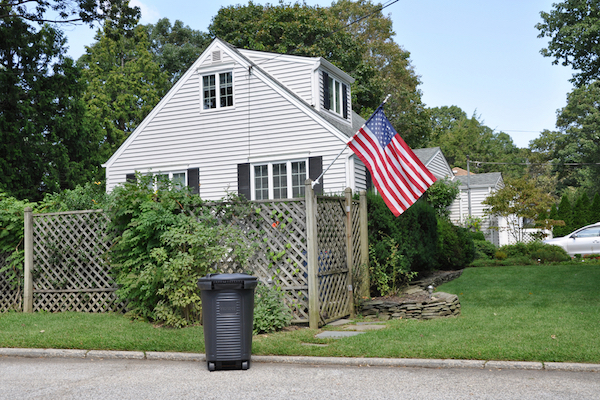 Trash can in front of house by Shutterstock. “Poop smells. I don’t want it in my trash can.” — It’s a trash can. Sometimes trash smells. Even non-poop trash sometimes smells. That’s part of the reason why it’s trash. “Why can’t you just carry your poop bag on your walk?” — Because it smells. Ha! Kidding. Kind of. Why carry it to a trash can at home when there is a trash can right here I can use? “It’s not your trash can” — Technically, it’s not yours either. It’s the city’s (at least here in Los Angeles, that is the case). “I don’t have a dog. I don’t want dog poop in my can” — How do you even know? Are you really that interested in your trash can that you are itemize things that placed in it? “It’s not right or fair” — Welcome to life. Poop happens, and life isn’t fair. There are people on my side of this battle who suggest it’s better to throw the poop in a trash can, any trash can, than to leave it in someone’s front yard. I don’t like that argument. It’s beneath us. Of course, we are picking up our poop in your yard. Even when no one is watching. Even when there is a sign forbidding the actual act of a dog pooping. Just because I dare to throw trash in your trash can doesn’t mean I’m a monster. 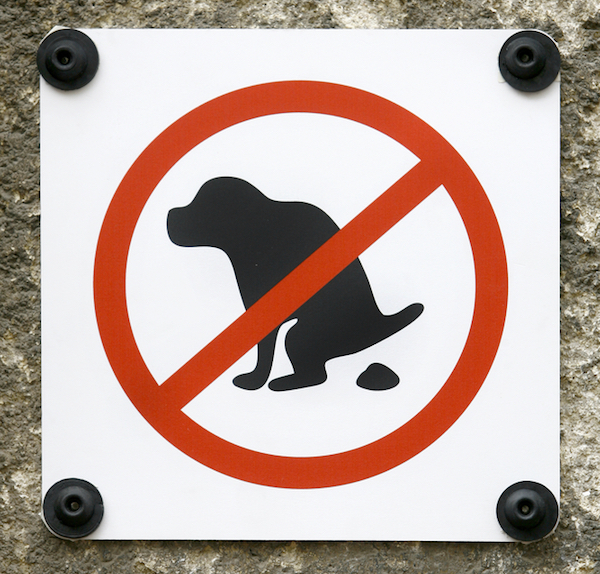 No pooping sign by Shutterstock. I display more of a “free love” attitude toward my trash cans and the items in it. If you have something you want to toss in (something legal that is — no random body parts or anything sinister like that, please) be my guest. Mi basurero es su basurero. I know this is a passionate subject for some people. Just head over to your Nextdoor page and scroll for a bit. I can almost guarantee you will find someone all up in arms because some “crazy person” dared chuck their dog’s poop bag into their can. I’ll save them some sleuthing: It was probably me. Those against such action help me out. Why is it so terrible? Why does it make you so angry? Why do you have such attachment to your trash cans that you won’t tolerate sweet lil’ me tossing in a tied-up bag of dog poop? I just don’t understand! The post I Throw Away My Dog’s Poop In Your Trash Can. Why Does That Make You So Angry? appeared first on Dogster.